Pechenegs (печеніги; pechenihy). The name of a Turkic tribal federation that dominated the southern steppe region of what is today Ukraine from the late 9th to the mid-11th century. The Turkic appellation be-ča-nag (‘brother-in-law’) was first used in the 8th century to refer to members of the Pecheneg ruling clan. The Pechenegs (Patzinaks in Byzantine sources) originated beyond the Aral Sea near the midstream of the Syr Darya River in Central Asia. Their center was near present-day Tashkent. The sedentary ruling stratum (the Kangar) was of Iranian origin (see Iranian peoples). 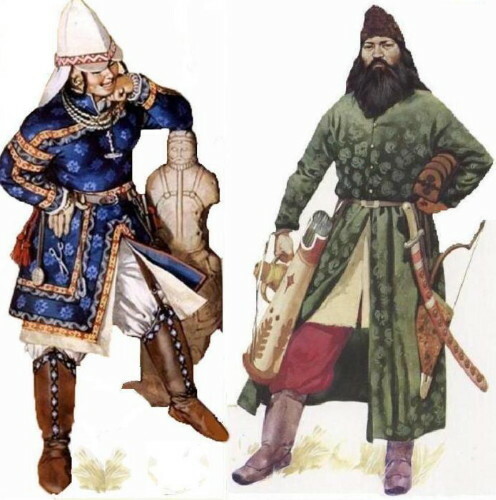 In the early 9th century the Pechenegs were defeated by the Oghuz (Torks) and forced to migrate from Central Asia to the lands between the Ural River and the Volga River, where they warred continuously with the Khazars. In the 880s the Khazars and Oghuz jointly defeated the Pechenegs and again forced them to flee westward. In 889 the Pechenegs attacked the nomadic Magyars living between the Don River and the Dnipro River and forced them west of the Dnipro River. Later they drove the Magyars across the Danube River and themselves occupied the steppe between the Don River and the Danube River. The Pecheneg domain was divided into two wings separated by the Dnipro River and ruled by the two highest-ranking leaders. The ruler of the western wing was the senior of the two and bore the imperial title of kagan. Each wing had four provinces subdivided into five districts. Each of the 40 districts provided a division of 10,000 mounted warriors. They were masters of lightning mounted maneuvers and were renowned for their art of fighting from fortified wagon encampments. The Pecheneg regime was a kind of military democracy, in which all important decisions were made by a general council. The kagan’s seat and the council’s meeting place were probably located in the Ros River Valley. Until 1036 the Pechenegs had an estimated population of 2.8 to 3 million. By 1048, when their domain was left with only 11 districts west of the Dnipro River, their population had been reduced to approximately 800,000. Like all nomadic societies the Pechenegs were not ethnically homogeneous or unilingual. The ruling elite spoke Iranian, whereas most of the population spoke Turkic with a significant admixture of Hunno-Bulgar elements. By the time the Pechenegs had arrived in Ukraine, they were familiar with various religions, including Christianity, Buddhism, and Islam. They were most attracted to Manicheism, and Archbishop Bruno of Querfurt’s mission to convert them (ca 1007), which was aided by Grand Prince Volodymyr the Great of Kyiv, was unsuccessful. Islamic missionaries, however, had managed to convert most of the Pechenegs by 1010. The Pechenegs’ economy was based on trade and livestock. Their main trading partners were Rus’, which bought their cattle, sheep, and horses, and the Byzantine colony of Chersonese Taurica in the Crimea, which bought their hides and wax. The Pechenegs also served as intermediaries in trade with Asia and ensured the safety of the international trade routes. They did not practice slavery. To retain their mediating role among their neighbors the Pechenegs entered into coalitions with Byzantium (in 914, 968, and 972), Kyivan Rus’ (in 944), and other states, usually against former allies. They often invaded Rus’ with the encouragement of Byzantium. In 968 they attacked Kyiv, thereby forcing Grand Prince Sviatoslav I Ihorovych to cut short his campaign against Bulgaria. In 972 a Pecheneg force led by Kagan Kuria routed Sviatoslav’s army at the Dnipro Rapids and killed the prince. During Volodymyr the Great’s reign the Pechenegs attacked Pereiaslav in 988 and 993, Vasylkiv in 996, and Bilhorod in 997. To defend his realm Volodymyr the Great had lines of fortifications built along the Stuhna River in Right-Bank Ukraine and along the Desna River, the Oster River, the Trubizh River, and the Sula River in Left-Bank Ukraine. He also hired Tork and Oghuz mercenaries and began recruiting the Torks as military settlers (later known as Chorni Klobuky) to defend his frontier against the Pechenegs. The Pechenegs were often used by the Rus’ princes in internecine conflicts, until 1036, when the army of Grand Prince Yaroslav the Wise crushed them near Kyiv. From the early 1040s the Pechenegs were constantly confronted by the Torks, who themselves had been forced to migrate by the Cumans. In the late 1050s the Pechenegs lost control of the entire Left-Bank steppe and later the Right Bank and were forced by the Cumans to migrate west into the Danubian Byzantine territories or across the Carpathian Mountains into Hungary. In 1091 Byzantium was saved from the Pecheneg threat by the unexpected arrival and support of the Cumans, which enabled Emperor Alexius I Comnenus to rout the Pechenegs. After another defeat in 1122, the Pechenegs disappeared as an independent force and were assimilated among the Cumans and Bulgars. Some of them entered the service of Rus’ princes (documented for the years 1097–1169); most of those later migrated to Hungary, where they managed to remain autonomous until the 14th century, when they were assimilated. Geographic traces of their presence in Ukraine include Pechenihy, in Chuhuiv raion, Kharkiv oblast, where archeologists discovered a 9th-century fortified settlement (possibly a political center); Pecheniuhy, in Novhorod-Siverskyi raion, Chernihiv oblast; and Pechenizhyn, in Kolomyia raion, Ivano-Frankivsk oblast.